Khost are back, the industrial doom metal merchants featuring the duo of Andy Swan and Damian Bennett. Governance continues the perpetual heaviness of their earlier albums, a monolithic grind woven with ethnic samples that make their industrial doom sound so distinctive. Governance, once again, features the rhythms of the late Daniel Buess, the spoken word of Syan, Oxbow's Eugene Robinson and the cello of Jo Quail. From their previous releases Copper Lock Hell and Corrosive Shroud this might be business as usual but Governance is by far a more expressive release that gets progressively more experimental and harsher where sounds as diverse as noise and ambient seep into their immense distorted drenched based sound. Early industrial music hangs heavy over Governance and so too does the experimental noise rock of Techno Animal and Ice but that's perhaps not too surprising as Khost share an acquaintance with Godflesh's Justin Broadrick. Both members have rubbed shoulders with Godflesh's Justin Broadrick, with Andy Swan being part of Final and Damian Bennett featuring in Techno Animal. They're merely reference points as what Khost are doing is something particularly singular and it is exhilarating and frighteningly good. Khost are unremittingly brutal and their mammoth doom chords grind and vibrate throughout the first half of Governance, encompassing ethnic chants and throat-shredding vocal rasps. 'Redacted Repressed Recalcitrant' lunges into slow buzz generating chords adopting a start-stop Swans like structure. So heavy and dense and performed as a half-paced crawl, layering full-throated holler and chants with a demonic vocal undertow over mechanistic rhythms. It continually grinds to an abrupt halt before steamrollering on. It's colossal and one not to be missed. Ditching the ethnic chants for ecclesiastical choirboy singing, 'Subliminal Chloroform Violation' lurches forward to a clipped mechanistic rhythm and heavily distorted doom chords leaving trails of distortion to follow in its wake. After the brutalist onslaught of the first two tracks, 'Low Oxygen Silo' is more fragmented and experimental in its structure. A heady concoction of sombre strings, atmospheric hiss, and location recordings. A sax or some other type of instrument constantly billows giving this a free jazz feel, like Ice or Techno Animal or even 16-17 the avant jazz outfit that featured the late Daniel Buess who supplied the rhythms for Governance. When the low growled vocals and guitars kick in, in bursts of heavy floor scraping riffing propelled by powerful rhythmic beats - and at times surrounded by screams and eastern wails - it is as if Khost's doom metal has been given a complete industrial overhaul, and that's saying something for a band whose previous release, Needles Into The Ground, was deconstructed (and reconstructed) by Godflesh's Justin Broadrick. 'Cloudbank Mausoleum', which follows, shudders to low end bass pummels and loose rhythmic drumming. It foregoes the heavy scraping doom chords for a starker low growling vocal rampage surrounded by arcs of guitar distortion between passages of sparse punishing drum beats and electronic tone vibrations, before ending on spoken word from Eugene Robinson. The Oxbow frontman is by now a regular fixture on Khost recordings and this marks his third appearance on a Khost album. 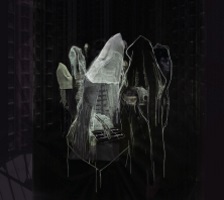 You might by all accounts consider Khost an industrial doom metal band but what follows on Governance really shows the progressive nature of Khost, and their willingness to incorporate other influences into their harrowing onslaughts. Catapulted from a scream of the title, 'Demenized' is a punishing noise wall; a cascading haze of distortion layering searing guitar attacks with caustic vocalizations, wails and pummelling rhythms. 'Demenized' catches Khost in full-on attack mode. I sense that the themes of detachment and dissonance that Governance was written under was no doubt fuelled by the years of cuts, division and discrimination that comprise the ongoing uneasy political climate we're all currently living under. A stream of anger, disgust and defiance seems to run throughout Governance. The knocks and hollow pummels of 'Coven' are enveloped by the low down mix of careering vocal rasps and cyclical distortion before hurtling onwards into grinding doom metal, while on 'Depression' Khost flex their experimental noise muscle with a curious assemblage of glitchy tones, explosive beats and short blasts of guitar all drenched in distortion, as the vocal rips through this alongside those customary ethnic chants that make Khost so distinctive. Surprisingly, Governance features a number of more ambient tracks including the drone based '[ ]' replete with a forlorn voice hesitantly asking "Do you see them?... There's something for you... Can you see it?". Meanwhile an air of Current 93's more atmospheric works hover over the opening segment of 'Stockholm Syndrome' which closes Governance with spoken word from Syan recited over tumbling notes before the gruelling attack of guitars and voice kick in and quickly return to the female voice proclaiming there are "just traces left". What really surprises me about Governance is 'Defraction'; it's nothing like that I've heard before. A devastating horror score saturated in doom metal sonics, is how I'd best describe it. Opening to loping bass and hollow thuds it collapses amidst doomy piano chords allowing a sombre cello score from Jo Quail - another regular Khost collaborator - to surface before they reappear drawing in hushed guttural tones. And even when the distortion drenched guitars emerge they shadow Quail's pleasing score, as the vocals repeat the title until it all abates with piano notes. Like their previous albums the final track is passed over to external hands to remix one of the earlier tracks. This one remixed by the Israel based drum and bass producer Adrian Stainburner aka Hostage who casts explosive beats and hypnotic textures to the grinding doom chords of 'Coven' intensifying the rhythmic thrust and overall atmosphere into an oppressive and punishing rush.